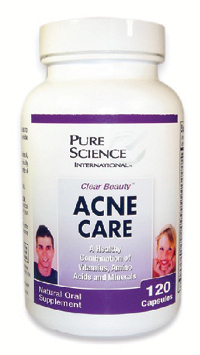 Clear Beauty™ Acne Care Capsules, is designed to help promote healthy skin and a clear complexion. Critical vitamins are added to help improve your skin’s overall health, healing the body and skin from the inside out, resulting in a happier you. Pure Science International believes that an individual’s skin is the mirror to their inner health. The toxins and imbalances within the body are reflected on one’s skin. By attacking the imbalances within the body that impact both the inner and outer health of an individual, a healthier complexion and a healthier you will appear. Clear Beauty’s Acne Care support products (Oral Supplement & Cream) have been tested by Dermatologists, skin professionals and people just like you, on virtually all kinds of skin types. This includes a wide range of ages, cultures, races, and on both men and women.